Take a good look at this picture. (Cool thanks!) Believe it or not, this image began as a picture of a girl (my delightful friend Molly), sitting in the studio against a black background. No lake, no sky, no seaweed, no need for an underwater camera housing and certainly no fish. To some people, including my past self (let's call him Past-Bert just for fun), would look at this picture and think, "How the heck did they do that!? I could never take a picture like this!" Past-Bert saw all kinds of crazy composited images back in the day (somewhere around 2007-ish) that just blew his poor little mind to pieces (small ones). He was thoroughly enjoying photography, but Past-Bert hadn't even dipped his toe into the compositing pool yet. Now I like to think I often scuba dive in the deep end. Allow me to let you in on a few of my dirty little tricks that help bring my composites to life! One of the biggest mistakes many beginners make while taking their first crack at compositing is to not pay attention to the lighting. Light is our best friend - without it, pictures wouldn't even exist in the first place. It can make anyone look pretty when treated correctly. However, light is one of those friends that will punch you full in the face if you deny it some quality one on one time. Allow me to elaborate. In "The Elemental Line" (It's the picture at the top of this post if you missed that…), the main light source is clearly coming from above the subject and slightly off to the right. My intention was to convince the audience that the light source was the sun and not a flash set up in the studio. Once you decide where your light is coming from, you have to lock that down and not budge. If I had put some really beautiful image of a vibrantly colored sunset with a bright sun approaching the horizon behind her, it would probably look pretty awesome at first glance. However, after any closer inspection the image would have lost its believability. The light on my subject's face tells you that the sun is high in the sky, so if I can see the sun off in the distance it makes zero sense. Zero. Whether or not they catch onto the reason for it, the viewer is going to know something about the image looks fake. You've really got to pay attention to what the light in that situation would do. 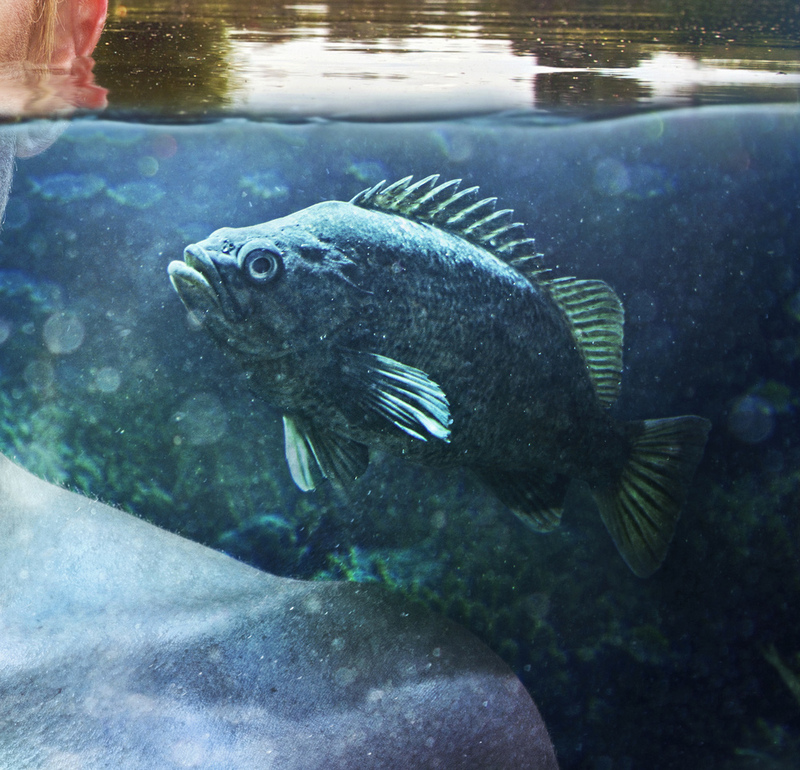 If I had placed the fish to the left of her, the light falling on top of his head (yes I've decided the fish is a boy) wouldn't work because he would be in her shadow. Furthermore, once I did place the fish on the CORRECT side (in the light), I had to add his shadow to her shoulder. So, always be sure to select your background and any other pieces you might use with your subject's lighting in mind. One thing that I find very important in compositing is to try not to let the image look too flat. My goal is always to envelope the character into the setting I'm creating for them. To help achieve this, one of my favorite tricks is to not skimp on the foreground elements! If there is an opportunity to put something in the foreground that overlaps both my subject and the background, I'm all over it. For "The Elemental Line" I decided to put some seaweed in the bottom corners to fake another layer of dimension. That way I have the seaweed up close on one plane, my subject a little farther back in the middle ground, the surface of the water right behind her, trees and grass farther behind that, and the sky behind that. Even the clouds are adding to the illusion that this landscape is a vast and deep space. The way they get smaller and smaller as they get closer to the horizon line tells your eye that they are much farther away. All these different layers of depth help to sell the image and make it appear as if she is in an actual environment rather than just slapped onto a background. You might also notice that I blurred the seaweed in the foreground. This says to the viewer, "Hey viewer, this foreground element was actually in the picture, but it's out of focus because it was much closer to the camera." If I had the seaweed as sharp as the girl, then it tells your eyes that it's REALLY close to her (aka less depth). It doesn't have to be a crazy drastic blurring, in fact if you do too much "un-focusing", it can start to look pretty fake. My favorite blur to use for this technique is the lens blur filter; it does a really great job of mimicking how a camera would capture things that are out of focus. A subtle blurring of the foreground and background elements makes your subject appear even sharper and really tells your eyes where to look. Also, it's never a bad idea to sharpen your subject a bit (and anything on its focal plane, aka fish) to further this effect. Okay people, I'm about to let you in on one of my favorite tricks. It was passed down to me by a dear friend and I use it on basically every image you've ever seen of mine, composited or not. Here is what you're gonna do. (WARNING: I'm about to speak "Photoshop" to you. Hopefully you are fluent, but for those of you that are just starting I'll attempt to annunciate and speak slowly.) First, make a new Hue/Saturation adjustment layer above all your other layers. You do this buy clicking the little icon that looks like a half-filled-in circle at the bottom of your Layers palette. (It resembles one of those delicious black and white halfmoon cookies...dang now I want cookies.) This brings up a little menu from which you can choose "Hue/Saturation." In the Hue/Saturation properties palette there is a small box near the bottom labeled "colorize" - check that guy. This will make your overall image monochromatic tones of one color. DON'T PANIC; this is correct. Now change the hue number to 25; this will make it an orange-ish color. Next set the blending mode of that layer to "Soft Light" (from the drop-down menu at the top left corner of your layers palette that currently says "Normal") and turn the opacity down to somewhere around 15%. Any of these steps can obviously be tweaked to your liking. You could go with any color tone you wish and also mess with the opacity until it pleases you. I just find that this orange-y hue usually has a nice effect overall, especially on skin tones. Basically what you are doing with this technique is making your darks a little darker and richer and your lights a littler brighter and warmer. It will give all of your layers a more similar feel and this is what we want. Your overall goal is for people to believe that your subject is actually wherever you've decided to place them. If all the images composited together have a similar tone and feel, it's going to be much more believable. Yay you did it! Now reward yourself with a cookie! Remember that Past-Bert fellow? Well he was full of silly assumptions before he earned his wings (no unfortunately I don't actually have wings, but that would be the best thing ever). Along with thinking everything had to be super sharp, Past-Bert was under the impression that noise and grain were tiny little speckles of pure evil. In some cases this is quite true. It's definitely a major goal of many photographers to capture images that aren't super noisy. We lust after opportunities to rock 100 ISO. However, when used correctly, noise can be a very helpful tool. By now you'll have hopefully done some artful blurring to elements in your image that you want to appear closer and/or farther away from the subject. This blurring will essentially get rid of any grain those layers might have had. So now, even if your subject is a very high resolution file with minimal grain, it's going to look a little noisy next to your smooth blurred layers. This is where tip five comes into play. We are going to ADD noise to the whole picture. "WHAT!? You are going to purposely add grain to your image rather than trying to get rid of the evil speckles!?" (Says Past-Bert) Yes, that's right, calm yourself. Any image of mine that you've seen has had noise added to it at the very end. Don't worry, it's not a crazy amount and when done correctly will essentially go unnoticed. This technique gives all your layers a similar texture and quality, blending everything together a bit better. It really marries all your blurred and sharpened layers, and adds just one more attribute to convince the viewers that these elements were actually captured together. What I do is fill a layer with a middle grey color, then add somewhere around 3 points of noise. You do this by going to the "Filter" drop-down menu at the top of the screen, then go to "Noise", and then "Add Noise". Now set this grainy layer to the "Soft Light" blending mode (you can also try "Overlay" and see how you like that, but I find "Soft Light" to be more subtle.) You may have to add a bit more or less noise and also adjust the opacity of the layer depending on the picture. As I mentioned, it shouldn't be a super noticeable change. Well friends, thank you all for tuning in. Hopefully this all made sense and you can try some of these maneuvers on your own images. Feel free to let me know if you have any questions or if I can explain anything a bit better - I'm happy to help! If only this was a time-traveling blog and Past-Bert could read it…he would have lots of questions. But also he might learn too much too quickly and by now I would be an evil genius or something. It's probably a good thing this is just a regular non-space-time-continuum-destroying blog…..